Amy Vetter is a Mindful Technologist and Creator of the B3 Method®. 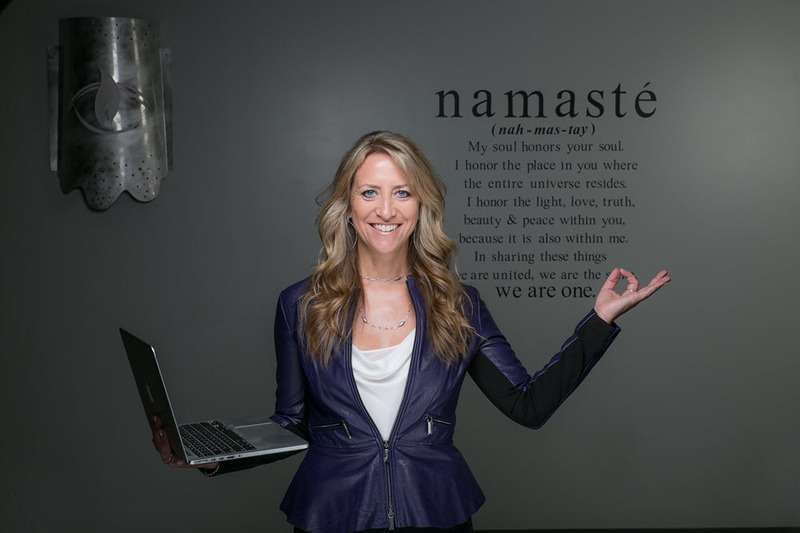 She is an engaging keynote speaker, corporate board member, and CEO of The B3 Method Institute and Drishtiq Yoga. Amy is an influential contributor to Inc.com and Entrepreneur.com, and offers a unique perspective as a CPA and Yogi — who specializes in Technology Innovation — to inspire business professionals to transform their careers, companies and lives. Learn more atwww.amyvetter.com and follow @AmyVetterCPA on Facebook, Instagram, LinkedIn and Twitter. I grew up hearing stories about my immigrant grandfather who became a CPA to ensure a better life for his family and generations to come. From as far back as I can remember, I would tell people that I was going to be a CPA one day, not really even knowing what that meant. Even though I was telling a story of becoming a CPA, most of my time was spent playing violin, viola and painting. When it came time for college, I continued to pursue accounting, and I left my music behind. After graduating, I was driven to achieve my goals to become a partner in a CPA firm. I achieved that by the age of 32, and at that moment, I had a breakdown. With no goal in sight after achieving it, it was the first time I awoke to my journey and questioned myself on how I had designed my life up to that point. I began yoga at this moment in my life, not by choice, but by necessity. I had recently had my second child and was sick after the pregnancy. Because of that, the doctor would not allow me to do my normal intensive “boot camp” type workouts. The only exercise I was allowed to do was yoga. During this time of self-reflection, yoga helped me learn how to take time for myself, be alone with my thoughts, and allow emotions to arise, rather than pushing them down. This began, what I call pivots in my career. It means not giving up all the expertise you have to go in different directions, but instead finding a way to utilize the skills you have in new ways. I realized through this journey that my real passion was helping small business owners as I grew up helping my mom in the office of our family business — a maid cleaning company. Based on this reflection, I ended up leaving the CPA firm and moving into the accounting technology space, working for global corporations where I led customer success, marketing and sales programs in in the United States and globally. I was able to take the knowledge of the accounting profession and help move the technology space forward to improve the way they delivered services to their clients — most of whom were small business owners. During this time, I also opened a yoga studio. I felt the need to provide a place where others could learn the benefits of yoga for themselves. It started as one heated room, but soon I added a non-heated room, retail, virtual yoga, and developed a teacher training program to create future yoga instructors. This has all led me to what I am doing today. Based on my journey and background as a CPA, yogi and technologist, I launched a company called The B3 Method Institute. The company is based on my work-life lessons and book Business, Balance, and Bliss: How the B3 Method Can Transform Your Career and Life. I authored this book toprovide business people with a framework for getting back to their authentic selves and maintaining happiness as an adult as too many times we get away from the things we love as we become older because of all the demands in our lives. As part of The B3 Method Institute, I’m also a keynote speaker and travel the country speaking on how to create what I call “work-life harmony,” and how to use technology mindfully to create greater human connection. Recently, I also expanded The B3 Method Institute to provide ongoing learning and integration of the B3 Method into my clients’ lives. I provide online learning — delivered once a week, that is no longer than a 5–10-minute commitment of self-reflection and intention setting. I also have a private Facebook group for members, meditation videos, live events such as webinars and retreats, as well as group coaching. I am continually inspired by the audiences at my speaking events and the people who read my book. So many people have shared stories with me of feeling empowered to create greater work-life harmony in their lives by getting back to the things that they used to enjoy doing. I have had grown men remember that they used to love coloring and commit to start coloring again as an adult. I have also had people come up to me after I speak to discuss their plans to start playing an instrument again and share it with their children. And there are other people who share that they have always wanted to paint and have finally decided that it’s okay to just enjoy it and not be perfect. A major premise of what I teach is that when you find more happiness personally, you are better for those around you. Finding and committing to an activity or hobby outside of work is a great way to recharge your soul and energy. To help people find what’s right for them, I challenge people to try a new activity for 30 days to see if it’s a fit. One accounting firm leader implemented my 30-day challenge with a commitment to walk each day. That in turn inspired others on his team to create their own 30-day challenges. Now the other staff members have been writing blog posts each month on their own 30-day challenges, including what they learned about themselves, and how they interacted with others because of it. I also love seeing the posts on social media from each person who has actually implemented the 30-day challenge into their lives. In fact, I recently saw one from a woman who took the painting idea to her team meeting at work and had her team paint blindfolded! Making the shift in my life that I needed to in order to properly balance work, my interests, and my family. As a mother, it’s easy to be hard on yourself and feel that you are not good enough in any area of your life because you are pulled in so many directions. I had to stop listening to that inner voice of self-doubt, and comparing myself to others. I learned to appreciate what makes me unique as a person and that I will never be perfect. I also started listening to what my children were actually saying and how they appreciated the type of mother I am, and that their lives were more enriched because of the experiences I have the opportunity to have and share with them. I also started putting limitations on my workday, I blocked time on my calendar for my own activities or my family’s, and didn’t give up that time because someone wanted a meeting. I not only changed the prioritization of my day, but I made a commitment to allocate the right amount of time for work and home. Not every day is perfect, but I make my best effort. This has always been my mantra for the teams I lead. I like to push people to do things that they never thought possible. I am an idea person and believe that if I don’t make everyone a little uncomfortable with new ideas, then we will never grow or stay ahead of where we need to go as a business. Even though it takes a little longer, I typically task my staff to figure out how to make certain ideas work, rather than doing it myself. The learning process is what grows someone as a future leader and provides them with the confidence to take on challenges themselves and figure out the resources they need. There is nothing more gratifying than watching people grow and gain confidence and being able to know there are successors to you so as a leader, so you can keep exploring the next best thing. My husband has been my support throughout my career. We have always supported each other’s careers, which means sometimes his takes more of a priority, or sometimes mine does. We discuss each career move with each other, and also ask for support if we are going to need each other’s help to take on more around the house. It’s not always perfect and does take compromise and a certain level of openness to figure out the pros and cons for our family, the impact on each other, and how important a certain career decision is for each of us. Without having open, honest communication, even when the weight is too much on one person or the other, I could not have done all I have done in my career. He is always my biggest cheerleader and believes that I can do what I set out to do. Overall, I take more risks in my career, while he has a steady career in what he loves to do. I simply could not have tried the things I have done in my career without knowing I had his support to do what I do. Also, my children have been very supportive. They love to learn what I am learning and participate in my businesses as well. Whenever I have doubted a decision because it may mean travel, they have always pushed me to do it and reassured me that they will be fine. It was difficult until I made it a priority. It began when I started yoga. I would work all day and go home in the evening. While I used to work again after putting my kids to bed, I found myself not wanting to because I didn’t want to ruin the peaceful feeling I had inside. I began to learn that I needed to ensure I had time for myself because I showed up better at work and with my family when I took time for myself. This meant starting to block time on my calendar, and not giving up that time because of a meeting or a request from someone else. That time for myself isn’t selfish because I know if I do not take that time, I will not be as calm and focused as I need to be with the people around me. Even if it is just 30 minutes, the time is non-negotiable on my calendar. I have found that if you start giving that time up, people notice, and then they don’t take you seriously when you block out time for things you need to do for yourself. Consistency is key, as well as, not blaming “too much work” or “too much travel” as a reason not to do it. You can always find time if you are motivated to do it. As I would get the promotions I was working for, it also meant working more hours and having less time for myself. When I was pregnant with my first son, I ended up on bedrest because of problems with the pregnancy. I continued to work from bed, and if I had to go to a check-up with my doctor, I would stay on calls for work up until the doctor came in, then I would pass the phone to my husband for him to listen in to make sure that I wasn’t missing anything while meeting with the doctor. When my son was born six weeks early, life shifted. No longer was there the same importance of being on every call every minute. Instead, we were worried about his health and wellbeing. After that experience, I realized that work can wait. Since then, I have tried many ways to shift my workday or create a life that is more flexible when I need it to be. I also have found that taking up new hobbies has motivated me to do other things besides work. As an adult I learned bass guitar. I learned it because as my children have grown, one plays guitar and the other one sings and plays drums. I learned bass, so I could play with them, and then my husband decided to learn keyboard — so we became a band! We call ourselves the Vettinaterz. When we have a concert we are preparing for, I find it forces me to practice and stop working. I don’t always accomplish this, but as long as I stay focused on it, I am reminded to let work go when I need to, so I can be present for those around me. Forget work-life balance — strive for work-life harmony instead. The term work-life balance stresses me out because you can’t be balanced with all of your activities and commitments, all of the time. Instead, I like to think of it as “work-life harmony” instead. This means that you’re engaged in work and life at the rhythm that makes sense for you at any given time. So, accept that there will be times when you need to work a lot and will spend less time with your family. But when there is an ebb at work or you’re in between projects, don’t try to fill the gap with more work that’s unnecessary. Take this time to rest and be with your family until your next project. Be fully present at work: To be present and make more time for your personal life, you need to be fully present at work so that you can get things done when you are at the office, not at home. To be present, make sure that when you’re in meetings to not to be distracted by emails, texts, phone calls, etc. Set your phone aside or better yet leave it outside the meeting room. Then plan to meet for 25 minutes instead of 30, or 50 minutes instead of 60, so you have 5 to 10 minutes in between to clear your mind or quickly respond to important communication so you can be fully present for your next meeting. Rediscover what you loved doing as a kid: So few of us end up doing work or jobs that are based on the things we naturally gravitate toward. And many of us have forgotten what those innate interests are. To rekindle them, try to remember what you loved doing as a kid. Was it playing music? Coloring? Or organizing plays with the other kids on your block? Now find something related to that, which you could start doing again. Music was always a big part of my life growing up, but I stopped playing viola as soon as I started working. When my teenage son decided to learn guitar a few years ago, I decided to learn bass guitar and now enjoy playing in our family band and find it to be a great way to recharge my brain as well. Make your hobbies known: It’s important to show your team that you have interests outside of work and make time for them. If you don’t do it, your team will not think they are empowered to take time for their own interests. It’s important to block your calendar for these activities or time with your family and don’t let people schedule over them. This shows that you’re not just paying lip service to work-life harmony, you are living it and want them to as well. Trust your team and learn to delegate: Many leaders make the mistake of not delegating work because they think they can do it better than their employees. This may be true in the beginning but it’s important to invest the time in your employees to help them learn how to complete the work to your level of expectation. Over time, this will pay off in spades. Not only will it give you more time back in your day for greater work-life harmony, but it will empower your employees. Watching my children grow up to be capable, talented, and caring people is my biggest sense of accomplishment. I value that our relationship lets us talk openly about their day and what is going on in their lives and reason out the issues that they have at school, with friends or in athletics. I always want them to know they have a safe place to fall. I also love seeing people become inspired by the work we do at The B3 Method Institute. This fuels me to keep creating and delivering more content and traveling around the country to speak. When you see the light bulbs go on for people, or they tell you about the real changes that they are making in their lives as a result, then you know the work you are doing matters. I would inspire people to learn someone else’s story. So many times, people make assumptions about other people based on their appearance or initial impression. These assumptions create stories that may or may not be true about that person. Imagine if we actually asked the questions of our co-workers, leaders, and acquaintances that would help us learn their backstory and how they came to be the person they are? I think it would help us to find more connections with each other, reduce our misunderstandings of one another, and limit the assumptions we make that can cause a divide, when there actually could have been a connection.